I always find it helpful to have a back-story for my characters. Even if none of it actually appears in the book, it informs me as a writer. It took me some time to figure out Fabriel’s status but, once I had done so, I needed to create a backstory for him. In his particular case it was essential to the plot, not just for his character. Who was he? Where did he come from? What had happened to ensure that he would be at King’s Cross on the exact day, at the exact hour that the fire broke out? Did it have something to do with the distant past? When playing around with different ideas, it became obvious that a common link between his present and his past had to be fire and that led me to witches and witchcraft. Not surprisingly, the Internet is a good place for witches. There are many specialised sites dedicated to all things Wicker, as well as sites such as Wikipedia (no pun intended!) and more general sites. What I was looking for was a specific story, a true story that I could use as the basis for the events in Fabriel’s past. I found some of it in the story of Agnes Bernauer, though I needed to adapt it quite drastically. The final story of Fabriel’s past is only very losely based on Agnes story, though I did borrow her name. For instance although the real Agnes was condemned for witchcraft, she was actually drowned – as common a death for witches as was hanging or death by fire. In the end her story served as inspiration rather than being mined for facts. Agnes Bernauer was born around 1410, the daughter of the Augsberg barber-surgeon Kaspar Bernauer, although some accounts describe him as a baker and others say his existence has never been proven. 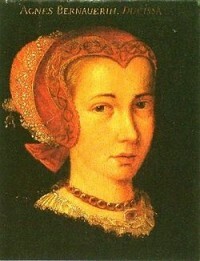 After meeting her, it is supposed at a tournament in February 1428, Albert, Duke of Bavaria, took her off to Munich. There is a possible reference to her on the Munich tax roll of the same year. Within four years she had become an integral part of the court. There is no doubt she was Albert’s mistress and it’s possible she was married to him secretly. Duke Ernest saw Agnes, a commoner, as a threat to the succession and, egged on by the Palatine Countess Beatrix, Albert’s sister, he took steps to get rid of her. On 12th October 1435, while Albert was away on a hunting expedition, Duke Ernest had Agnes arrested, accused of witchcraft and drowned in the Danube as a witch. When Albert returned and discovered what his father had done, he endowed a perpetual mass and an annual memorial celebration in the Straubing Carmelite Cloister in her memory. The following year Duke Ernest erected the Agnes Bernauer Chapel in the cemetery of St Peter Straubing. Probably to appease his son. Memorial masses are said to this day, though these are now an annual event, rather than a daily one. Agnes’ story not only helped provide a framework for Fabriel’s story. It has famously inspired many dramas, operas, poems and plays and is even celebrated in a unique cake - the Agnes Bernauer Torte.